Tim O’Rourke’s Vampire Seeker (Samantha Carter #1) release & signed paperback GIVEAWAY!!! COMPETITION NOW CLOSED. THANK YOU ALL WHO ENTERED! To win a copy all you have to do is add your name below in the comments box, or visit us on Facebook and add your name there. Closing date is Thursday 23rd January 2014 and the winner will be randomly selected thereafter! Good luck, guys! Book Blurb: Samantha Carter believes that a vampire is responsible for the brutal deaths of four women in Whitechapel, London, England. Each murder is identical to those committed a hundred years before by a very different serial killer. With the police on her tail, as she is seen near the crime scene, she follows the stranger she believes a vampire and murderer as quickly and quietly as she can. She ends up at a Tube station and boarding a train she sees the stranger take. With only moments before the police reach her she pushes her way through the carriages to find her ‘vampire’. Throughout the following pages words are exchanged and then there is a bright light…. Check out the Amazon UK and Amazon US links! P.S. You can always check out our reviews of some of Tim’s other works here! 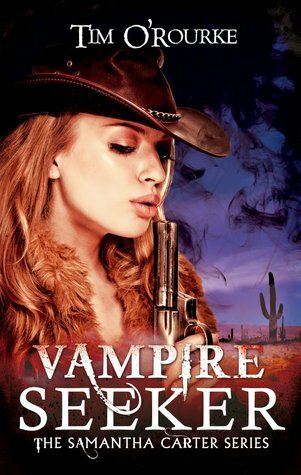 This entry was posted in Competition, Fantasy, Giveaway, Mystery, Paranormal, Sci- fi Romance, Sci-fi and tagged competition, Giveaway, paranormal, Samantha Carter, Tim O'Rourke, time travel, vampire, vampire seeker, wild west. Laura Carter. I would love this book!